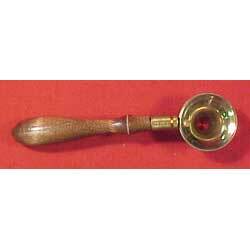 Polished brass funnel with attractive turned wood handle. An easy way to load shotguns, shot pouches, powder horns and flasks. Also handy in kitchen and camp cook box. Funnel is 1-1/2" dia.